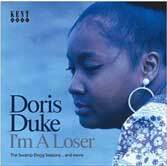 When Dave Godin cited "I'm A Loser" by Doris Duke as his favorite album of all time, he selected a masterpiece of soul singing, song writing and production. Jerry Williams Jr wrote ten of the 12 songs (with either Gary Bonds or George Jackson) he produced with such artistry. The second album is a bonus along with the tracks she made in the sixties as Doris Willingham. When the album was first release in 1970 on Canyon records US it was only available as an import in the UK. The fact that you can buy this CD from Amazon and Play.com means it must be part of EVERY soul collection. Compilation and notes by Tony Rounce and issued by ACE on CDKEND 242.